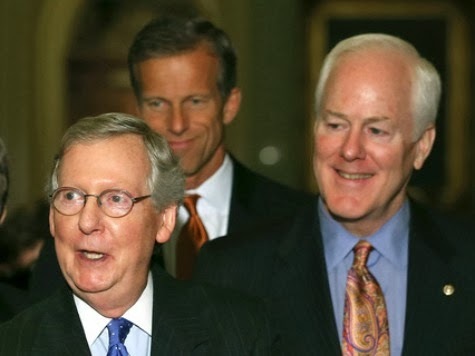 McConnell and Cornyn whipping Republican votes against Ted Cruz's filibuster? How about Millard Fillmore and Franklin Pierce? In 2008, I could hardly bring myself to vote for McCain. I knew Obama was trouble, and McCain was the only option available. The same was true with Cornyn. Down ballot, I had a lot of trust in GOP, but not much for the top of ticket. So I voted straight-ticket. I actually considered taking my vote away from Cornyn. He was likely to win anyway, but he needed to be humiliated. Alas, I decided I was being too picky. Leland ... I posted another remark on the Rand Paul thread, where I finally found a link to the 1st amendment to the CR...e.g., HJ 59....which does contain text purportedly "defunding" the ACA. My take is still the same, CR's are temporary measures and such text would require enforcement. By whom would be the question. Next, the amendment has some wording that conflicts with the Anti-Deficiency Act. In short, a temporary measure seeks to invalidate two Acts of Congress that are already law. How this applies here on this thread is that McConnel knows it too, and this is a Kakuki show between players for personal propaganda. They, both sides, all sides, flat out admit the effort is to determine who gets the blame, either way. They are debating who can be the most negative and avoid blame. Period. I won't be impressed until it dawns on all of Congress that they will be the reason a good system, like FEHBP, is brought down, which it will be if the ACA is not defeated by rescission, not a temporary measure in a CR. Aridog, I accept your explanation here. It seemed previously, you were being a bit simplistic. I'm certainly no fan of the CR, and I believe the Senate has enjoyed forcing a CR over the last few years, because the 111th Congress got the budget they wanted. I support Cruz for the same reason I opposed Dewhurst. Dewhurst has a lot of power as Texas Lt. Governor. Yet, Dewhurst routinely avoided tough decisions and gave into any Democrat that had the slightest backbone to stand up to him. If Dewhurst thought a legislative vote would go by party lines, he typically didn't bring it to the floor even though his party held the majority. He did this while the Texas Democratic Party would do things ilke flee to Oklahoma to prevent a quorum. Texans wanted a better leader than Dewhurst, and we got one in Cruz. Now Cruz is in Washington, and we are watching the Republican political leaders, including our other noodle Cornyn, run out and yell "what's the point, we're going to lose anyway". I see Democrats loyalist saying, the House voted 42 times, "what's the point". However, a strong Republican party managed to prevent Hillarycare from becoming law in the 1990s. Democrats didn't say, "oh well, we tried and lost". They kept fighting, and now we have Obamacare. If there is any hope to rescind the law, Republicans have to show the same tenacity as Democrats. I see that tenacity in Cruz and Paul. I don't care if McConnell or Cornyn think this is all Kabuki. Neither has managed to grow the Senate nor show control over any Republican Senator, whether it is Cruz and Paul or McCain and Graham. McConnell and Cornyn represent the weak leadership in the Republican party, and so it is no surprise that while lacking strategy, young bucks are willing to challenge their leaders. I do completely agree with you on this: I won't be impressed until it dawns on all of Congress that they will be the reason a good system, like FEHBP, is brought down, which it will be if the ACA is not defeated by rescission, not a temporary measure in a CR. Well said! I also apologize for thinking your view a bit simplistic. You are definitely not simplistic, but after reading a few people who are; I kept in that same mode in response to you. 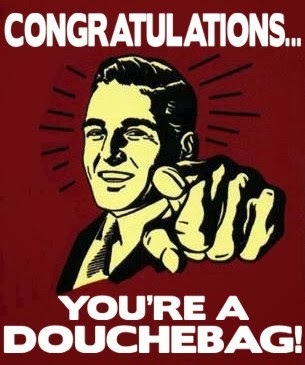 I need to get that "Congratulations, You're a Douchebag" image on a tee shirt before the next poker night with the guys.